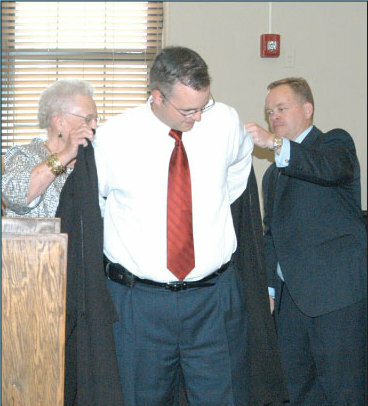 William “Bo” Leach was helped into his robe by his grandmother, Edric Newman shortly after taking the oath of office as district judge at the courthouse last Friday. Newman served as Madison County Circuit Clerk for many years and Leach credits spending time with her in the courthouse as one of the reasons he became a lawyer. Estill County Attorney, Rodney Davis, for whom Leach has worked since graduating from law school, also helped.